Ever heard of ‘Rooster’ potatoes? Many of you probably have not. Albert Bartlett premiered the Rooster potato in the United States last summer at the Taste of Colorado. The potato was well received and more than 60,000 potato wedges (5 tons of potatoes) were handed out to event goers during the four-day festival in Denver. I found a bag the other day and had to try them at home. Adding ingredients that are often associated with a summer salad might sound strange, but this Caprese Stuffed Baked Potato was simply fabulous. I called my daughter Emily so she could stop by on the way home from work and take some home with her. She used them for a dinner she had scheduled with her friend Cindy and they were good enough I got a phone call later that evening with both girls offering an enthusiastic thumbs up! The Rooster potato is slightly smaller than a Russet potato and is wrapped in a pink, thick skin and is drier than other strains. You can bake it, boil it, mash it, roast it or fry it. Though starting pink, after baking the skin turns a golden brown but the important part is the end result. A yellowish and fluffy flesh made this the perfect potato to fill with these ingredients. Supple and easy to open, it yielded to pressure without falling apart, a great quality that is seldom heralded when talking potato! These potatoes have been in Colorado at select Walmart stores since last October. Have you seen them where you live? They’re definitely worth trying and there is nothing sponsored about that; just my two cents on something I loved and was excited to find at the grocery store; didn’t you hear my Whoo Hoo?? This was one of those dishes that was almost too good to believe considering the simplicity of preparation. It brought a reminder of a summer favorite to colder months with the use of roasted or sun-dried tomatoes. I found these at the local market in the Olive Bar; talk about easy and delish. Luckily fresh basil is available year round now and I used the mozzarella that comes packaged as a 16 oz log; certainly substitute shredded if you must; but the fresher version is so good…it’s what I would recommend. Pour enough sea salt onto cooking tray to be able to hold the potatoes, place the potatoes on the salt and bake until done; approximately 20-25 minutes. Mix together the Basil, Tomatoes and chopped Mozzarella. Drizzle with half the olive oil, mix thoroughly and season with salt and pepper. When the potatoes are done, remove them from the oven and cut an X into the top of each one; squeeze the potato to open it up. Place a heaping tablespoon of the mozzarella, basil and tomato mixture into each potato, drizzle each with a bit of the remaining olive oil, season with salt and pepper and serve hot. Love those rooster potatoes. I think they taste a little more buttery than the average spud, too. I’ve not heard nor seen rooster potatoes around here yet but I do love this way to serve them up! I think these are just genius. I’ve been craving baked potatoes for some reason lately, I absolutely love how you stuffed these. I’ll have to keep an eye out for Rooster potatoes around here! These are so good Aggie; and even better? So simple. If the Rooster isn’t in your neck of the woods I would use a red potato or Yukon gold in a heartbeat! Baked potato and caprese, I’m loving this idea! This will be on my table this weekend! That is one gorgeous potato Barb! I love that it’s so simple to make – will definitely be making during La Crosse season!! Rooster potatoes are new to me – sound interesting. Caprese isn’t, of course, although I’ve never stuffed potatoes with that mix – super idea. Good food styling and composition the photos (nothing new in that, though!). Good stuff – thanks. I had never done it either John and now it’s a new favorite for sure. Like for lunch again today! Thanks for kind words; I’ve come a long way but still have so much to learn. YUM! 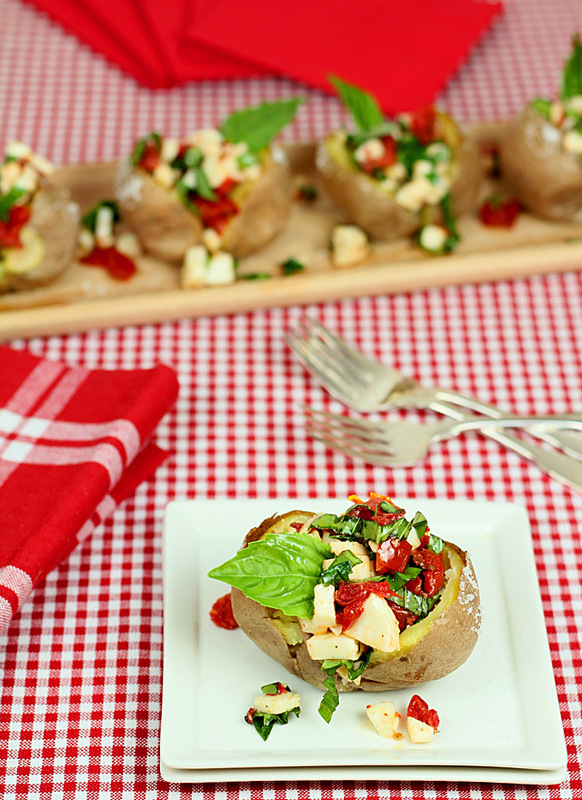 I love Caprese anything, but hadn’t thought of baked potatoes! My mother in law is often surprised in our American grocery stores when it comes to the potato selection– hardly anything at all! In England all the different types of potatoes are labeled and presented in the store in an appealing way, with each type having a preferred way of cooking (roasting, baking, boiling, etc). I am going to look for this Rooster potato to expand my American view of potatoes! This is the first I’ve heard of rooster potatoes! I’ll definitely keep an eye out for them in our markets. I’m putting this recipe on my list for later in the year. It just screams summer barbecue to me! Yum and double yum. I tried the potatoes at the Taste of Colorado last summer..and have to admit I did go back for several samples:) I enjoyed the potato but haven’t seen them since. I’ll have to check out my local Walmart this week and see if they are available. I know Idaho is known as the potato state but I have to have a shout out for Colorado potatoes…they are sure good. I’ll be interested to hear what others think about the potato. Thank you for letting me know they are available. It’s one of those things where they found the perfect spot in our state and the San Luis Valley was it; I could have added more history but I didn’t want to look like a sales rep, it was the topping that really made them special. This looks fantastic! I haven’t seen Rooster potatoes but now I’ll be on the lookout. I love all these fresh ingredients packed into the potato instead of the normal fixins. Rooster potatoes or not, I think I’ll be trying some sort of caprese stuffed potato this week! I would do these in a heartbeat with any potato Kate; I happen to notice these and they are great but I’m thinking that topping also had ‘just a bit’ to do with it. So easy, so good…it’s all I had for dinner! Hey, if the ingredients are good, then simplicity is all you need for a great taste, right? This looks like it would make a fantastic meal. I wonder if I can find potatoes big enough to stuff here in France? I think the mozzarella and roasted tomatoes would be great! I would do the same with a number of other potatoes Jamie…the topping made the dish more than anything. If I had not spied these it would have been a small red potato! It’s what we had for dinner; nothing else was needed! A major player over here (UK) and I’m pleased to hear something of it’s history. I originally included additional history Pat and it started to sound like a sales pitch so revised it back to just some basics but they’ve been very well received here; some well known restaurants have been using them exclusively for the past year. Such a brilliant idea. I love the fresh flavors of the caprese filling! Truth is I normally reserve all things Caprese for summer when I can get the best home grown tomatoes. This is a great alternative using roasted or sun dried tomatoes; next up is my favorite pasta dish! Its almost like a salad inside of a potato! I really want to try this. That it is…and the trying is SO easy. Minutes to put the ingredients together while the potatoes bake; a great side sure but also a great quick meal. Me too! Now if this stupid showing at my home would just hurry and be over I could go have one for lunch! I love caprese anything!! This looks so good! Thanks Shanna…and tastes as good if not better than it looks…don’t you love those recipes? You crack me up. OK. Or no…I can’t – it was fabulous!!! 🙂 Love that…even cuter than my favorite word – yummalummadingdong! These look amazing. All my favorite fillings. I can’t for someone to develop a carb free potato. Maybe that’s next. You never know. I’ve never heard of rooster potatoes before but I did hear you “Wooo Hoo” when you found them! 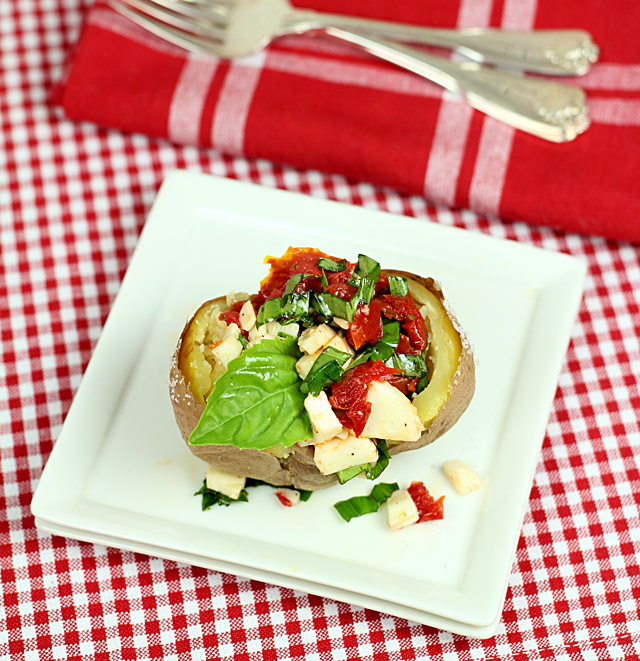 Your idea for caprese stuffed baked potatoes is brilliant! Brilliant I tell you (and your photos set the perfect mouthwatering scene)!!! They were SO good Renee; though I am giving that topping some credit…why have I never done this before? So good!! Seems it’s about time right…buy hey these are little potatoes; they actually are just placeholders for the really good stuff!